Indeed, whether in nursing, or in life, women may believe a woman's heart is tender and vulnerable to heartbreak, while at the same time capable of boundless capacity for love and tenderness. We often forget the physiology of our hearts, until Heart Month rolls around, and we receive a few reminders. A woman's heart may be capable of a life and love we desire, but heart disease IS a risk we need to recognize. In fact, heart disease remains the #1 killer of women. In parts of the country, cancer has begun to creep up to overtake heart disease as the overall killer of men and women, but unfortunately, women don't know that. Only 1 in 5 women believe that heart disease is the #1 threat. Ultimately, women don't know enough about heart disease in general. When they DO experience a cardiac event, they may not recognize the symptoms. They could have shortness of breath, overwhelming fatigue, flu-like symptoms, or heartburn. They may delay seeking medical assistance, which adds to the problem. Thus, more women than men are likely to experience sequelae following their first heart attack OR not survive the event at all! Women need to know this. They may have spouses that have survived 3-4-5 heart "attacks" or cardiac procedures and still appear functional, but that is rarely the case with women. As we saw recently with actress Carrie Fisher, the first event may be the only event that occurs, whether a lethal arrhythmia, or another type of underlying cardiac condition. So, whether you are falling in love this month, experiencing a break-up, or just watching old re-runs of The Notebook, think about and talk about a woman's heart. Keep the conversation flowing. Wear Red all month if you missed National Wear Red Day on Friday, February 3rd, 2017, or visit their web page (honor.americanheart.org) for other fun activities to raise awareness. Keep the conversation going all year long! What's especially important is to discuss heart disease and women, including the fact that ethnicity treats women differently. African-American women are disproportionately higher risk for stroke and heart disease than Caucasians, and Hispanic women, while highly active at caring for family members (38% more so than other races), are much less stringent about caring for themselves, and thus are high risk themselves. And as nurses, we may be the same. We work hard, care hard, and love hard but we don't always put ourselves first. Let's place our hearts on the priority list for a check-up. Don't be another women's statistic. Nurses deal with sorrow and loss on a frequent basis, so much so that it becomes an occupational hazard for some specialties. Yet we never quite get used to the feeling. Whether professionally or personally, grief can feel staggeringly overwhelming. It can encompass us in a way that makes it nearly impossible to move forward or to maintain our usual workload. These feelings may be especially distressing during the holidays or at the start of a new year. When I lost my mother, I could keep moving and managing a façade of normalcy if I was busy and "doing." Once the planning and organizing phase had passed, huge sobs would engulf me throughout the day, as if I could no longer keep the grief and sadness contained. Friends were understanding, offering hugs and words of kindness, but each hug brought forth another burst of tears. I wasn't sure what was happening, as I normally could maintain my "cool" and keep working through the pain of loss. With the help of family and friends, I realized I was moving forward, but in a way that was totally different from my expectations. This experience taught me that movement-forward movement-is not always what we expect, especially when dealing with loss. It may be slower, it may be quieter, and it may be very vulnerable. Talking about loss is an excellent way for nurses to share how they feel, especially when they experience grief that is sudden or uniquely personal. There is always a patient that touches us in ways we don't quite understand, that rocks our soul and gets under our skin when they breathe their last breath. We carry a piece of them with us and don't often take the time to reflect on what made them so very special in our lives. We may be on to the next case or the next critically ill patient without pause, building up a shallow veneer of scar over the acute pain of loss, without realizing what it is we are feeling until the next passing. Suddenly, the grief becomes too much, and we need a chance to pause and reflect. For me, the holidays are tough... no parents left to hug, family is far away, and many times close friends are busy working additional shifts. This isn't unusual; it's the typical scenario for a nurse. For a few nurses, looking towards the New Year added to an additional sense of loss. While they were not entirely pleased with the past, an uncertain future could also leave many with uneasy feelings. What types of jobs will be available in the coming years? How much change should we expect? Yes, moving forward can be tough, but most nurses live a purpose-driven life, which helps. Even through the height of grief, nurses wait for the first breath of spring, when they can plant new life in memory of loved ones or lost patients. Life, it seems, must be treasured and honored, especially once it is gone. Labels. Professionally, we may not think twice about their use, except for the harsh glare we give when we hear a peer or physician mention a patient by a diagnosis rather than a name. Unfortunately, after an election year that was filled with negativity and name-calling, we've grown wearier than ever using labels in our private lives. But labels are hardly benign. When we start grouping people into categories and dividing them by components, life becomes more complex. Within the last year, we've learned it isn't as simple as "men" and "women" when labeling bathroom access, and not all adults see themselves as fitting into binary codes related to gender. We have become a society where the initials LGBT have become more socially "aware," even though many of us may have grown up in small communities with teachers and students who never acknowledged the word "gay." I consider myself to be reasonably tolerant. Most of my nursing peers would say they are equally so, and all would say we dislike labels. We dislike informing patients they fit into categories called "obese" or "morbidly obese" even though we may be required to educate them regarding the relationship of being overweight to risk for a multitude of disease states. Yet many of these same nurses can't resist labeling patients as "frequent flyers," "potentially drug-seeking," "difficult," "challenging," or "demanding" when they see behaviors that aren't easily met during a busy shift or when a patient doesn't perform as expected. Perhaps the patients are unusual or unique, but we should take a little more time before affixing labels to them. Once it's there, it isn't easily withdrawn, and judgments are made. We really can't escape, though. This process of labeling begins from the moment we draw breath, at 7 lbs 5 oz 21 inches, and ends when we draw our last breath, at whatever hour and minute we leave this earth. In between, we are labeled many things: tough, rebellious, hard-working, loving, challenging, difficult, amazing, thick, thin, young, old, healthy, in failing health, and a myriad of variations from this list. We could be described as difficult or easy to work with by the same group of people, depending on when and how you ask. That is why nurses generally dislike labels. Labels represent a narrow window of time, a singular focus. Life is not like that. Life is fluid and constantly changing. Labels. We stop to think about conforming to categories when filling out demographic surveys. Is it time for a new age group? 55-64? Race? Religion? Height? Weight? (Hmmm, let's see, are they asking for the weight on my driver's license, the weight on my home scale—which we know weighs heavy—or the last doctor's office weight?) Don't laugh, because the next category will be the BMI, which as any female knows, will label you as too short for the weight you have specified. OK, I digress, but if I learned anything during this year of negative press, amid the very contentious election of 2016, it's that although we generally dislike labels, there is one that I never mind utilizing. It's called being a nurse. That's one label I wear with pride. It never goes out of style! It requires no explanation and has survived the test of time. Go ahead, check that box! Make your mark large and proud. If you spend any time watching your favorite televised programs or leafing through a popular magazine, you may be surprised by the increased number of pharmaceutical advertisements targeted at consumers with chronic conditions. The "patients" are generally smiling and engaged in lively outdoor activities. They appear to be fully involved in life by the assistance of whatever medication(s) is heralded as the "next big thing." Crohn's disease? Diabetes? Psoriatic arthritis? End-stage lung cancer? Chronic IBS? They're not slowing these people down! Patients can't wait for a chance to talk to their physician about initiating one of these life-altering/life-extending medications. It almost seems too good to be true. Direct-to-consumer (DTC) marketing is utilized by only two developed countries in the world: the United States and New Zealand. Physicians often frown upon the continued use of this type of marketing as the ads are scarcely regulated by the FDA. Additionally, patients may ask for medications without knowing the full scope of the medication's indication, possible side effects, cost, and drug interactions. A medication may or may not be appropriate for the consumer. Because the advertisements are minimally regulated by the FDA, they may not even be screened for content prior to being viewed by consumers. Cost is a huge factor. Usually, the newest and most expensive medication is marketed without any mention of cheaper or non-pharmaceutical alternatives. One of the primary issues for uninformed patients can be cost. As an example, a relatively unassuming medication to treat toenail fungus was marketed to consumers via direct-to-consumer ads. You may remember the product. It was sold by an attractive, heavily-dimpled celebrity. Medicare patients had no idea what the actual cost of the medication entailed, and neither did their physicians, as pharmacies billed Medicare directly. It was only when these same Medicare patients fell into the "donut hole" of their policies that panic began to erupt, as they were billed $400-600 for the same 4mL container of antifungal liquid at their pharmacy. Mass hysteria ensued. Eventually, coupons were printed by the pharmaceutical company for reduced pricing, but the product was still out of reach for many senior citizens and those without insurance and/or high insurance deductibles. Hepatitis C is another area for massive potential profit, with one of every 30 baby boomers potentially testing positive for the virus. With the cost of one pill of a newer medication averaging ~ $1000, you can imagine the revenue. In the year 2015, the United States spent $9 billion treating Medicare patients for hepatitis C. "Are you ready for Harvoni?" the televised commercial asked consumers. Apparently, many of those watching desired treatment. It was unfortunate that only a year later a warning was issued that these drugs may cause dormant hepatitis B to emerge, requiring careful screening of patients prior to treatment. This may have been missed if groups had been previously treated. Ultimately, reaching consumers with chronic disease is great, especially if they can be encouraged to seek more active lives and be more fully engaged in their own care. However, with DTC advertisement, healthcare seems to be taking a backseat to profit. Before patients can be smiling, riding bikes, jumping around, and taking grandchildren fishing, they should proceed with caution on a note of "buyer beware." These ads are televised to sell medications, not necessarily safety. Profit appears to be important, not patient care. Those are models, celebrities, or actors in the commercial, and they may look like you, but they're not. I doubt there is a decent toenail fungus in the bunch. I'm not sure when exactly it starts, but I DO know that across the board nurses are very similar in one personality trait. We're universally hard on ourselves while being, inversely, very forgiving of others. We set our own bar unbelievably high. This unfortunate habit may kick in shortly after we articulate the Florence Nightingale pledge—when we vow to spend our lives in "purity" and to do all in our power "to elevate and maintain the standards of our profession." It may be, then, that we realize what we've taken on even though we've chosen this path willingly. These days, we come home from work, our minds spinning, our bodies weary. Instead of turning "off," we run through the day's activities like a CD, over and over, hitting pause and reset, pause and reset. I could have been quicker here or there, we believe. I could have had those labs ready a bit sooner for the physician; maybe avoided that nasty scowl for once. And why didn't I stop and ask my peer for help when I saw her sitting, taking a break, while my head was spinning? On and on and on.... Occasionally, we even awaken from a deep sleep, panicking, trying to remember if a medication was given or a task completed. Panic consumes us until we remember the event, then we realize we're just tired and overwrought. It's a rat race and there's no let up. We're not even good enough at home. We start to criticize how we function as moms or neighbors or daughters or community members. In an election year, we're not out in the community doing enough for the issues that are near and dear to our hearts. Let's face it: if we did let up on ourselves, someone in leadership or administration would be happy to pick up the slack by pointing out how we could volunteer for more committee participation or sign up for more responsibility at work. What a simple, beautiful thought. Unfortunately, this thought has eluded nurses for most of their careers. We are well-trained, compassionate, thoughtful human beings who place the care of others well before self-care. Maybe it's time to re-think that pledge we took and realize we need time to maintain our own health and happiness. Whatever we do today needs to be enough. Knowing nurses the way I do, I believe that whatever nurses do today will be great. Sheri* had awakened late; she knew it was going to be one of those Monday mornings even before the phone alarm failed to wake her. Her hair needed more than the toss of dry shampoo she gave it as she started a quick shower, and she fumbled with liquid soap as she temporarily froze. What was that, she thought? For a moment, blind panic raced through her mind like lightning as her fingers touched and grasped a hard pebble near her right axilla. Damn, damn, damn... this couldn't be what she thought it was. No way! Sheri knew she was way overdue for her baseline mammogram. At 48, and childless, she was considered to be higher risk. Her aunt and one older sibling had already been diagnosed with breast cancer. As a nurse, she thought she understood the risk. Approximately 1 in 8 US women (12%), she knew, would develop invasive breast cancer over the course of her lifetime. But this was her husband's fault, not hers! They had experienced a difficult year as a couple. He had lost his job, so she had been working extra shifts and overtime, trying to keep them afloat during the recession. His insurance had been the better deal, but they let it lapse when he had been let go. COBRA was not in their budget if they were to keep the house. But hey, they were both healthy, right? It was temporary, they told themselves. They worked out, they tried to watch the carbs and cholesterol, and up until the last six months, things had been OK. Well, maybe not so OK. The fights over money had been bad, and the stress was through the roof. Now THIS! Sheri decided not to tell him. She simmered and stewed inside, finally making it to work that Monday, but was late and her anger showed. By the end of the week, still angry but a bit calmer, she began to realize she was hurting no one but herself. What would one of her patients think if they were in this fix? This was her body and her responsibility! Assigning blame to someone else was another way of staying in denial. The lump was not going to disappear because she had experienced a difficult year; cancer does not pick and choose victims according to who is "good" and "bad." Cancer does not work on a scoreboard system, she thought. This isn't a game, and it definitely isn't half-time. Sheri told her husband that same day. Working together, they were able to COBRA his insurance and get diagnostic testing scheduled with a payment plan they could manage. The best news for Sheri was that the lump was benign. However, knowing her familial history, she scheduled further testing to determine BRCA1 and BRCA2 mutation potential. She also understood that risk for breast cancer increases with age, so she would have to stay diligent. Sheri learned that the blame game helps no one in the long run. She wasted valuable time. In her case, that time was spent in useless anger, fear and frustration. But it could just as easily cost someone a life. No one wins a fight when casting blame or assigning fault. Breast cancer is a fight that shouldn't be fought alone. It is everyone's fight. I've reached the age where a few of my peers have dropped off fulltime status in nursing. Their husbands are retiring, they have beautiful grandchildren popping up here and there, and holidays are looming. They're tired. They no longer wish to pull weekend and call rotation, so they quit. Yes, they leave with glowing eyes and an atmosphere of excitement, credit cards and baby clothes in hand. They even enjoy themselves for a while, but it doesn't last. The bloom wears off, the holiday décor starts to get stale and (unwatched) DVDs pile up on the coffee table. Bestsellers and magazines also pile up alongside recipes that haven't been taken into the kitchen. Dreams of an easy, carefree retirement seem so difficult. Nurses have such a difficult time leaving their profession that most begin to wander back, either volunteering part-time or working hospice or palliative care. The need to be needed, and to nurture is so strongly tied to our identity that it is almost impossible to leave that part of ourselves behind. We feel listless when not caring for others, whether it is for our families, pets, elders or the neighbors down the street. We also feel an incredible drive to stay busy, but busy in a way that feels productive to society. Reading gossip magazines doesn't have the same impact as assisting with a neighborhood food drive or charity fundraising for flood relief. We want our activity to matter. It may have been all those hours spent working feverishly to chart and care for patients within the timeframes we were given, but suddenly having hours of time to "squander" doesn't sit well with nurses of any age. As a matter of fact, it's hard to find a group of nurses, retired or otherwise, "sitting" for any length of time—it feels inappropriately wasteful. So, dream about retirement if you must, especially if you're in the middle of an obnoxious 12-hour shift, but don't be surprised if you find it impossible to actually leave the field of nursing when the time comes. Trust me, I've observed colleagues wandering back to caregiving and/or volunteering, because that was the only way they felt truly fulfilled! They might have been sitting rather than standing, or walking slowly rather than hustling, but they were giving everything they had. Maybe even sharing a recipe or discussing a book review. If you're a nurse, you spend an enormous amount of time explaining the unusual and uncommon events of everyday life, especially when those events might be concerning the health or safety of our Olympics team. This year, we were so busy focusing on mosquitoes and Brazil's ability to handle the crush of possible terrorism/mass casualties that we were totally unprepared for the banality of the questions we received. What on earth was happening with the Olympic swimming pools?! One day they were a beautiful azure blue, and seemingly before everyone's eyes, they turned a murky, unpleasant shade of green. What was happening? Were the swimmers in danger? Could the athletes be ingesting or swimming in water that was toxic? The press scrambled for answers, and so did we. Finally, answers began to arrive to clarify the "murky" (downright scary) concerns regarding the green swimming pools. In preparation for the Olympic events, Rio had allegedly underestimated the amount of supplies required to maintain the appropriate acidity for the pools. The abundance of swimmers had begun to alkalinize the water, changing the beautiful blue coloration into green, almost overnight. 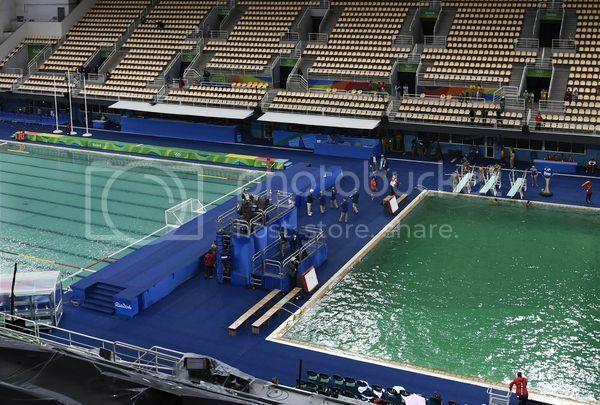 While proclaimed to be safe for the swimmers, the pool color was alarming, so the green pool was quickly drained, and swimmers were switched back to the blue pool. Oh, OK. Fears were calmed for the moment; it was safe to get back into the water. But wait-what about those large purplish marks on many of the swimmers' shoulders and backs? What were those? They appeared to be medicinal hickeys, described as "cupping" marks by Michael Phelps and a few of the other swimmers. Suddenly, patients watching TV as well as family members and people standing in line at the grocery had questions about cupping. What is it, does it work, what is it used to treat, etc., etc. A bit of immediate reading was indicated, and fast! Cupping, used by Michael Phelps prior to the Olympics, has been considered a type of alternative medicine in which cups are placed on the skin to create suction. It can be utilized in conjunction with acupuncture or used alone. It has been used for many purposes, but the most common indication is to help with pain, inflammation, and relaxation. It has also been claimed to work as a type of deep-tissue massage, and thus has become trendy with many athletes. The deep-purple "hickeys" are marks left by an increase in blood flow and capillary perfusion to the surface of the skin, which is created by the use of suction as the cups are applied. Cupping therapy may seem like a newer treatment, but it has been around since the era of ancient Egyptians. As far as research regarding efficacy, studies have been conducted but have been criticized for potentially containing bias. The best that can be said about cupping is that it is probably not harmful. It may even create a placebo effect for those who believe strongly in its use. Ok, the pools had gotten back to normal, and cupping appeared to be an appropriate therapy for athletes. Nurses could relax and plan for answering the usual questions regarding travel and mosquitoes. The Olympics closed with the Americans in great form, a gold medal count that was absolutely astonishing, and everyone in great shape. There was an itty bitty accountability and behavior issue, but that appears to be winding down in the press, too. We may have believed we had more time to prepare. Health officials and Congress had discussed allocating funds for research and planning, but Zika seemed so far away. The Presidential election, the Olympics, gun control, a sudden surge in violence, even the summer's hottest heat wave on record... all seemed of a greater urgency than a poorly understood virus that caused microcephaly. The disease could wait. But, suddenly, it was here. Uninvited. In our own backyard, in Broward and Miami-Dade counties. Four cases said to be of "native" transmission. That means, one of our citizens possibly had it first, not the mosquitoes. The mosquitoes were simply doing what they do best, transmitting the disease from host to host. Within a few days, four cases became fourteen, and panic began to set in. A few small businesses in Miami closed their doors. Phones in clinics and offices began ringing off the hooks as people realized what nurses knew across the country: we weren't prepared. We were looking the other way. Ready or not, Zika is here. Viral disease waits for no one-especially a disease where the "food" is human. Mosquitoes were merely utilizing us to move the virus around. We needed to be prepared, and we might have started a little late with this one. Several cities had begun sending out information, especially those with hot, humid environments (where mosquitoes would naturally breed). I particularly liked the message posted by Houston public official Dr. David Persse, who has encouraged a common sense approach to fighting Zika. Although he describes his anxiety level as a "7" on a scale of zero to 10, he cautions the public about getting too crazy, and he encourages city employees to fight Zika through a 3-D approach: drain, dress and DEET. Drain all unnecessary areas of standing water, such as kiddie pools or old tires in yards. Dress with light cotton or linen long sleeves, socks, and long pants when possible. Apply an insect repellant with DEET to exposed areas of skin. Limit exposure outside if possible, especially on hot, muggy days. Zika will most likely move to other areas of the country. I believe it would be unreasonable to assume it can be contained to the two zip codes in Florida where it has been detected. As a global society, the virus is on the move. Nearly 80% of adults who have tested positive for the virus have been asymptomatic. The most frightening nature of the disease is the damage left in its wake to the unborn, as seen in Puerto Rico. Hope is finally on the horizon. A vaccine is in the works, and human trials are starting. After a delayed start, let's hope aggressive action is taken to conquer Zika as it hits our backyard. Although it's easy to say utilize a 3-D approach (drain, dress, DEET), that approach is much, much harder for vulnerable communities and individuals without appropriate resources: air conditioning, housing, funding, and use of contraceptives. Zika has been determined to be passed via sexual contact, so temporary precautions are important. That's where my anxiety stays higher than a "7," because assertive action is needed the most. By virtue of a chronic illness, I have a dual perspective on healthcare. As an occasional patient, I am able to more closely understand both the provider and the utilization side of care. As a result of my experience, I have learned that bedside communication can be enlightening, perhaps representing a barometer of how a particular institution may be doing overall. Does the staff seem stressed, stiff, or robotic? Do they ask the same questions over and over without appearing to wait for a response? Have you noticed they get to the doorway of a patient's room, ready to leave, then stiffen a bit as they ask, almost as an afterthought, if they can do anything else? I dislike this part of a hospital stay, because it tells me the staff has been trained to work from a script. Many hospital systems, large and small, have adopted this practice. Hospital executives and administrators initiated scripting plans a few years ago, when staffing cuts and budgetary constraints caused Press Ganey scores to dip. Nurses and support staff were given key phrases to say when entering and exiting patients' rooms, to make sure patients were given a chance to ask for bathroom breaks, pain medication, liquids, etc. The idea was to make them feel special, to make the whole "patient experience" above reproach. Message boards were placed in patient rooms with information about their caregivers and pager numbers filled in around the clock. A few even filled in when the next medication and/or therapy session was "due" or included reminders about not getting up without asking for help. These were excellent ideas, but what I loved most, as a patient, were the genuine moments of heartfelt sympathy and true conversation with my providers-the times when they saw me looking sad or grimacing in pain, and they took a few minutes to laugh or share a story. A few of my nurses knew I was an NP, but many didn't. Several stopped by just to chat about dogs or discuss family members who had experienced the same surgery. The glow in their eyes, the beautiful aura of human connectedness in those moments could not be faked. Their touch was magical, and I say that not just because I, too, am a nurse. It's because their true joy is in what they bring to the room, not what they say as they're leaving. In fact, I saw a bit of the joy dissipate as they said words they were expected to say when they left. Not because they didn't want to know if I needed anything, but because they were going off their own script, and their hearts weren't in it. Some of the beautiful patina had already left. Nurses across the country have watched in shock and consternation as the amount of violence and brutality escalates in cities and communities. Hardly a day has gone by without an additional, heartbreaking tragedy being broadcast over every category of media. We've passed beyond shock. Our heads are bent and bowed with worry. Some of us have lived through times similar to these before-the devastation of 9-11, the years following the Manson murders, as well as horrific campus riots in the past. We know that venting so much anger and frustration is not the answer for building lasting cohesion. We've seen it previously in the workplace; the divisiveness of "us against them." We didn't use hashtags, but we knew how to break down teams and divide the feeling of community. We played "new" nurse against "experienced" nurse, day shift against night shift, full-time against part-time, and we got the negativity and blaming initiated. We've done this for years. It never made any of us feel proud, or safe, or happy to be part of something bigger than ourselves. It felt demeaning and sad. Joyless. After the IOM got involved, we went further and started making nurses feel "inferior" if they lacked degrees, even if they were phenomenal bedside providers. Oh, we knew all about divisiveness and lack of teamwork! Now, nurses look at the world around us and see the similarities. We see that the divisiveness, the breaking down of people into "us" and "them" via hashtags has led to a world where violence begets further violence. It shouldn't be this way. It MUST not be this way. We can't break ourselves down into individual parts. We are ALL Americans, and as such, we are part of something that is so much bigger than individual families or groups. Freedom is something to be proud of, as nurses have learned when they stand together as a force with their collective numbers. "The ultimate weakness of violence is that it is a descending spiral, begetting the very thing it seeks to destroy...Darkness cannot drive out darkness: Only light can do that." Nurses have learned we must embrace our differences and stand as one for the better good. We are part of a profession that wants to stand proud, united, and humbled, no matter our backgrounds. We ask those who would continue to beget further violence to stand down. It's the only way. During the previous week, the country has seen about as much tragedy as anyone could bear, especially within the city of Orlando. Through the rapid-fire response of media, many have been quick to respond, with global outpourings of sympathy and expressions of support. Unfortunately, the opposite has also been true, as politicians and citizens have posted critical, irresponsible messages on social media, with a few maybe patting themselves on the back, offering "I told you so" as a response to grieving survivors. Fortunately, we have millions of nurses throughout the country who have been exposed to grief and unexpected tragedy through experience. We know that mere words cannot soften the blow of unspeakable events, and there IS no ready explanation for an event that is truly not explainable. Tragedy grabs life and holds on like the random click of a kaleidoscope; one click to the right or left and it's a totally different framework. Nurses see that almost every day. We hold the suffering close to us, comforting them when no comfort is available except to hear another human heart beating closely, the warmth and smell of another living individual to hang onto for a few moments of care when caring seems to have taken a long, long leave of absence. And who else but a nurse could really understand and comfort parents of a toddler so suddenly gone by a tragic accident in Florida? What type of world do we live in when other parents feel entitled to jump on social media and critique parents who have suffered such a loss?!! It's insane. Nurses understand grief so much better. We know that no one is immune to making mistakes, no parent perfect, no one above reproach. No one. Nurses are beautiful human beings, and during tragic times, there are not enough of us to go around. Nurses provide the backbone of reason for those who seem to be without, compassion for those who choose to be impassioned with unreasonable hatred, and the rationale for the world to become a better place. "Now fill the world with music, love, and pride". As a nurse, I couldn't have said it better. That's exactly what we're here to do. As new nurses, we manage our careers carefully, knowing we might get attached to patients and families easily. Policy and procedure manuals warn us about boundaries. We know not to spend time with patients or families other than in our professional status. We follow those rules to the letter. We don't want to form relationships with patients where boundaries get murky. But somehow, in a nursing career, those boundaries get murky anyway. Ask any nurse who has spent time arranging the last minute details of a wedding at the bedside of a dying patient, and she will tell you of the hours spent getting the cake, the guests, a little music, and having it come off without hospital administration blowing three gaskets....a few rules and boundaries were bent, broken, and blasted way off kilter for that one! And no nurse would disagree that this was necessary, regardless of policy or procedure. In nursing, we all meet our nemesis at some point. Mine was a 94 year old ICU patient with no family near the area. He knew he was dying, and didn't care what anyone said to him about anything except what could be done for his dog. I tried everything. I called the neighbors. I called what little family he had. I called the Humane Society. Nothing would please that man except for me to go retrieve his dog and find him a new home, which I did, thank God. The poor animal had been sitting at the gate in the rain for five days waiting for his master to come home. We eventually found a young man who loved the dog and took him home, and the man died peacefully thereafter. He was the first patient where I took the keys to a patient's house, but not the last. One oncology patient we had in another hospital seemed to form a close bond with me. I knew her anxiety was really a demonstration of loss of control and fear, so her endless stream of questions didn't bother me as they did a few of the newer nurses. I encouraged her to ask about anything that was bothering her. Ironically, of course, this had the opposite effect, and she usually had very few questions. She did, however, ask that I help donate a few supplies she no longer needed. That was the least I could do for her. (I had them in my office for weeks!). Since that time, I have broken more boundaries when needed, as have several of my peers. Nursing is a lot like coloring; we are creative human beings and it really is difficult to stay within the lines. Once you've seen the full spectrum on the color wheel, it's almost impossible to go back to less vibrant hues. There is always another wedding to plan, hand to hold, or another homeless dog to pick up and place, God willing. I'm sure as all nurses starting out, I had a dream. I was young, vulnerable, and naive', but I had plans. I wanted to be the best nurse I could become, AND I wanted to be a mother. As anyone could tell you, once plans have been made, things can go awry. Many years, miscarriages later, with heartbreaking pain, I had to scrap the idea of becoming a biological mother. Plans for adoption weren't as easy at that time, either. I poured my heartbreak into my career, hoping I could be really, really good at nursing. School I loved, patients I adored even more, but my body wasn't healthy, even though I pushed. A piece of emotional well-being seemed to be missing, an inert element or nutrient needed for wholesome functioning. I began to suspect what it might be when a dog was handed to me one day. She was ill, and I had no business taking her home. She had a line-up of medications longer than many of the ICU patients in my clinical rotations. Caring for her (and holding her) felt a bit like mothering to me. She seemed to need me as much as I needed her, and it opened my eyes to a new approach to nursing. Perhaps patients needed this, too? How many of them might have been deprived of the ability to caress fur, or hold an animal next to their heart, or experience a dog kiss? How many might die without seeing their precious pet again? Hospitals and facilities worked hard to change that around during the last few years, but as with many things in healthcare, this one may not last. I pray we work as hard to keep it as we did to get it on board initially. My dog came home eight years ago. Although her health problems continue, she opened my eyes and heart to what animals can do for the acutely and chronically ill. I now have a companion pup for my autoimmune illness, and we are in the process of learning how to help others with similar conditions. My journey in nursing has encompassed different paths, from critical care, to gerontology, pulmonary, and pain management. I may not be the "mom" I set out to become, but the joy of being a puppy mom and learning about animal assisted therapy (AAT) has taught me eons. Puppies (and I suspect maybe the human kind of youngster as well) can drive you to dreaming about naps in the daytime, and then have you doubled over with belly-crunching laughter five minutes later. Cleaning? Fughetaboutit! And we won't even discuss what they have done to the edges of my woodwork. In nursing, it is fabulous to have a life plan, but don't get stuck on it. Learn to be flexible, and see where you career willfully takes you. It might choose a better path. Like Beyonce, we need to take a long, cool sip of Lemonade. Aaaahhh, so refreshing. And absolutely nothing like what I had planned!